March 19 will be the final installment of the 2017 Winter Lecture Series. 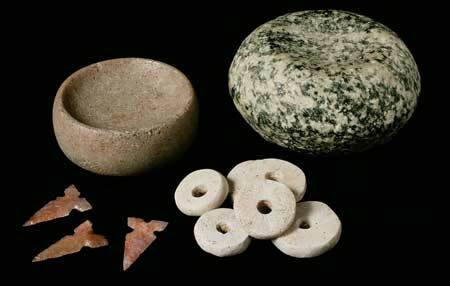 This presentation will discuss the changes occurring at Angel Mounds, Indiana. William Monaghan, PhD Indiana Geological Survey, Indiana University-Bloomington and Jeremy J. Wilson, PhD, Department of Anthropology, Indiana University-Purdue University Indianapolis (IUPUI) will be presenting “Anthropogenic Transformation and Population Processes at Angel Mounds: The Founding, Flourishment and Final Days of a Mississippian Village”. Abstract: Since 2005, archaeological investigations at Angel Mounds, a Mississippian village along the Ohio River in southwest Indiana, have tackled a series of questions related to anthropogenic transformation, the timing of fortification construction, and the use-life for various habitation components of the site. Collectively this research aims to understand the intensity and trajectory of population-level processes at the site from its founding in the 11th century through abandonment in the early 15th century. The well-controlled chronology and developmental history for Angel Mounds derived from a decade of excavations and re-analysis of collections shows that the site underwent different developmental phases. The first occurred AD 1070-1250 with the site serving as an unfortified, ceremonial center with intensive earthwork construction, but few permanent residents. The second phase included the development a fortified village and increased residential population after AD 1300. Meanwhile, the abandonment of Angel Mounds in the early 15th century is attributed to increasing socio-political instability triggered by escalating levels of regional warfare and climatic unpredictability associated with the onset of the Little Ice Age. For more information regarding this event, contact the Information Desk at 618-346-5160. Excercise your intellectual muscle while raising money for two archaeological non-profits at the Annual Trivia Night and Silent Auction Fundraiser on April 22, from 7-10 pm. The funds raised at this event will benefit Powell Archaeological Research Center (PARC), a group dedicated to saving archaeological data, particularly in the Metropolitan St. Louis area, and the Cahokia Mounds Museum Society (CMMS), whose mission it is to support the State Historic Site. Twelve tables will compete in 8 rounds of geography history, entertainment, and general categories for one of three cash prizes; $150, $100, and $80. The silent auction will showcase many hand-made and donated items, Native-American items, and gift cards and coupons. Tables are limited, so reserve yours by calling Lori at 618-344-7316. Cahokia Mounds is listed as one of the 1000 Places to See in the United States and Canada by Patricia Schultz. This is book is available at retailers everywhere and is a #1 New York Times Bestseller! https://cahokiamounds.org/wpress/wp-content/uploads/2017/01/1000-places-badge.jpg 1080 1080 Lori Belknap https://cahokiamounds.org/wpress/wp-content/uploads/2015/06/museum-society-logo-e1539985156282-180x180.png Lori Belknap2017-01-05 12:07:082017-01-05 12:07:08We're in the Book! The 2017 Winter Lecture Series begins January 15 at 2 pm. The first installment is Geophysical Prospection and Excavation of Middle Woodland Mounds in the Lower Illinois Valley. Jason King, PhD, Director, Center for American Archeology, Kampsville, Illinois, will present on geophysical surveys and excavation of Middle Woodland mounds. This presentation will discuss recent insights gained at several mound sites in the valley and their importance for understanding Illinois Valley prehistory. The second lecture will take place February 26, at 2 pm. Tamira K. Brennan, PhD, Illinois State Archaeological Survey, American Bottom Field Station Coordinator will present Insights and Updates on Greater Cahokia from Excavations at the East St. Louis Precinct. This presentation overviews the results of the past five years of analysis and reporting on ISAS’ research at the East St. Louis Mound Complex. Abstract: The Interstate 70 approach to the new Stan Musial Veterans Memorial Bridge lies over what was once a Native American mound center second only in size to Cahokia: East St. Louis. From 2009-2012 the Illinois State Archaeological Survey (ISAS) undertook extensive excavations at East St. Louis, revealing a densely occupied village and ceremonial center that spanned the Terminal Late Woodland and Mississippian periods (AD 900-1250). In total, over 6,000 archaeological pits, structures, monumental posts, and other features were uncovered. These features and the materials recovered from them tell us about the daily life of the peoples who once inhabited this region, about the social and political structure of their society, and about how East St. Louis, Cahokia, and many other villages large and small together formed one of North America’s first and largest pre-Columbian cities. This talk overviews the results of the past five years of analysis and reporting on ISAS’ research at the East St. Louis Mound Complex. On March 19, at 2 pm, G. William Monaghan, PhD Indiana Geological Survey, Indiana University-Bloomington and Jeremy J. Wilson, PhD, Department of Anthropology, Indiana University-Purdue University Indianapolis will present Anthropogenic Transformation and Population Processes at Angel Mounds: The Founding, Flourishment and Final Days of a Mississippian Village. Abstract: Since 2005, archaeological investigations at Angel Mounds, a Mississippian village along the Ohio River in southwest Indiana, have tackled a series of questions related to anthropogenic transformation, the timing of fortification construction, and the use-life for various habitation components of the site. Collectively this research aims to understand the intensity and trajectory of population-level processes at the site from its founding in the 11th century through abandonment in the early 15th century. The well-controlled chronology and developmental history for Angel Mounds derived from a decade of excavations and re-analysis of collections shows that the site underwent different developmental phases. The first occurred AD 1070-1250 with the site serving as an unfortified, ceremonial center with intensive earthwork construction, but few permanent residents. The second phase included the development of a fortified village and increased residential population after AD 1300. Meanwhile, the abandonment of Angel Mounds in the early 15th century is attributed to increasing socio-political instability triggered by escalating levels of regional warfare and climatic unpredictability associated with the onset of the Little Ice Age. Join us for a fun new way to support Cahokia Mounds! The Museum Society is hosting a fundraiser at Painting with a Twist, 3760 Green Mt. Crossing Dr., Shiloh, IL on January 14, from 1-4 pm. The fee is $35. All supplies are provided and their artist will guide the instruction step-by-step so there is no need for experience! Children 7 and up are welcome to register. Painting with a Twist will donate HALF of all registrations to Cahokia Mounds! You will be painting your very own winter scene and supporting cultural preservation and interpretation. There are only 45 available spots in the studio so join us on January 14 and paint with a PURPOSE! Register by going to www.paintingwithatwist.com/shiloh/. 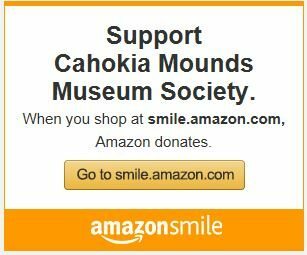 You can support Cahokia Mounds when you shop at Amazon.com using the Amazon Smile portal. By clicking the link below, which designates Cahokia Mounds as a recipient, Amazon will donate 5% of your qualifying sales to Cahokia Mounds at no additional cost to you! From all of us here at Cahokia Mounds, have a safe and Merry HOLIDAY SEASON! 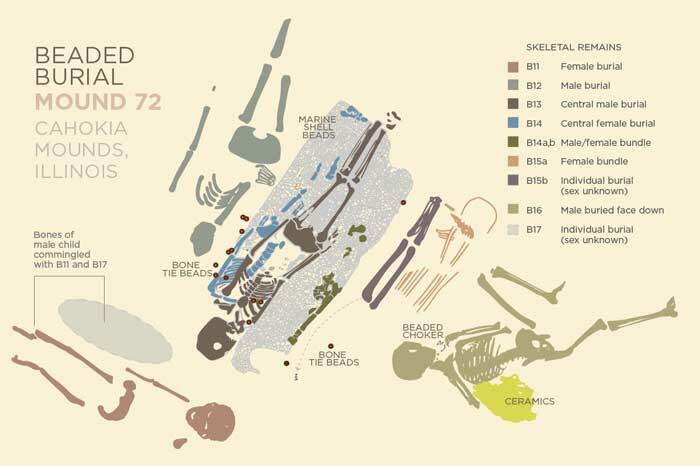 When Mound 72 was first excavated in 1967, researchers uncovered more than 270 people buried there in a series of mass graves. Many of them were victims of human sacrifice. “Now, we realize, we don’t have a system in which males are these dominant figures and females are playing bit parts. Linda T. from Shannon, IL won the raffle for the Cahokia Mounds T-Shirt Quilt. Congratulations to Linda who traveled from the northern edge of Illinois to Cahokia Mounds to visit the site! We appreciate your support! https://cahokiamounds.org/wpress/wp-content/uploads/2016/08/Quilt-1.jpg 3264 2448 Lori Belknap https://cahokiamounds.org/wpress/wp-content/uploads/2015/06/museum-society-logo-e1539985156282-180x180.png Lori Belknap2016-08-11 09:48:422016-08-11 09:48:42Linda T. from Shannon, IL Wins Quilt! We had a great Archaeology Day on Saturday! Over 3200 people came out and learned about the preservation and interpretation of Cahokia Mounds! The weather was perfect for this event. The excavations at E. Palisade, Mound 34, and the Copper Workshop were all open and available for tours and viewing. There were demonstrations on ancient crafts like flintknapping and bow-making. Professionals were here to explain faunal remains and animal skin identification, and you could learn how to throw a spear using an atlatl or play the waging game Chunkey. Visitors could wash ancient artifacts and sift soil excavated from the dig. Thanks to all who made this day such a great success!! The Mississippian Conference, held in the auditorium on July 30 from 8:30 – 4:00, is now full. There will be 18 presentations and several poster presentations that focus on recent research relating to Mississippian culture or Cahokia Mounds. PokemonGo is here! Find your Pokestops, and watch facebook for Lure times! Pokémon are here at Cahokia Mounds! We have stops all over the site and six gyms! Watch our facebook page for times we set Lures out. https://cahokiamounds.org/wpress/wp-content/uploads/2016/07/Pokemon1.jpg 1770 1020 Lori Belknap https://cahokiamounds.org/wpress/wp-content/uploads/2015/06/museum-society-logo-e1539985156282-180x180.png Lori Belknap2016-07-20 15:41:002016-07-20 15:41:00PokemonGo is here! Find your Pokestops, and watch facebook for Lure times! John Kelly has been added to the lineup of presenters with his presentation Contextualizing the Ongoing Excavations at Cahokia 2015-2016. 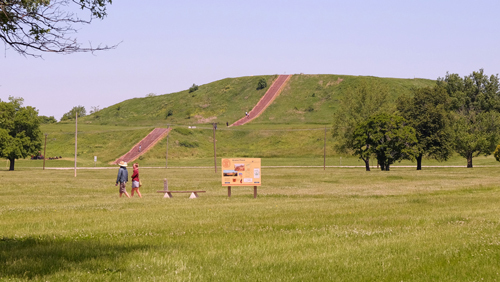 We offer a great Groupon offer to visit Cahokia Mounds! There are two offers; one is for 2 iPod tours plus a souvenir guide book and tote for $10, and the other is for 4 iPod tours plus souvenir guide book and tote for $13. These offers are transferable, and we will honor them after the expiration date. We have sold over 1300 of these offers and have a 94% positive feedback rating on the offer. 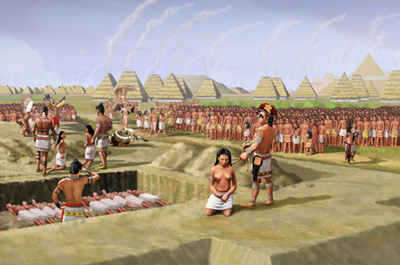 Simply go to Groupon.com and search for ‘Cahokia Mounds’ to get yours! It’s a great way to experience the site and includes outdoor audio tours to augment the Interpretive Center Gallery. Cahokia Mounds State Historic Site receives “Get to know m.e.” bench. Created by the 2015 “Get to know m.e.” campaign, the regional image campaign that celebrates why people love living and working in the Metro-East. Thirty-nine blue steel benches were donated to area public places complimentary of the campaign. Parks, town squares, historical sites, bike trails, and scenic views are now locations of the Metro-East celebratory benches. The American Association for State and Local History (AASLH) has awarded Cahokia Mounds State Historic Site with an Award of Merit for Wetlands and Waterways: The Key to Cahokia. This Leadership in History Award, now in its 71st year, is the most prestigious recognition for achievement in the preservation and interpretation of state and local history. This year, AASLH is proud to confer sixty-three national awards honoring people, projects, exhibits, and publications that represent the best in the field and provide leadership for the future of state and local history. 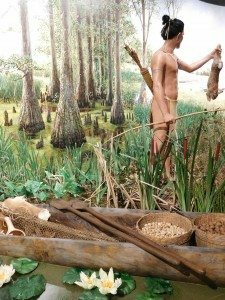 The Wetlands and Waterways exhibit project is a 52-foot, life-sized diorama exhibit that depicts the importance of the extensive waterways and natural resources to the growth and success of the culture that lived here from about AD 1000 – AD 1350. It features a 21-foot, 700-year old dugout canoe and an accompaniment book. “Wetlands and Waterways: the Key to Cahokia” focuses on life along the rivers and wetlands of the Mississippi Valley that gave rise to Cahokia Mounds, America’s first city. It includes a 52-foot-long mural depicting a backwater lake, river bluffs, forests and fields typical of the American Bottom floodplain. The mural serves as a backdrop to a life-size diorama showing a woman harvesting squash, other native crops, a lake and a man and a boy loading their canoe for trading with a nearby village. The dugout canoe is in its own case. Made of bald cypress between 600 and 700 years ago, it was found on a sandbar in the St. Francis River in Arkansas after a flood. The Illinois State Archaeological Society bought the canoe and donated it to Cahokia Mounds. It was submerged in a chemical solution for three years to help preserve it and was allowed to dry out for another two years. Tool marks and charring from the manufacturing process are visible on its surfaces. Visitors can get a preview of the exhibit at a reception from 7 to 9 p.m. Saturday at the Cahokia Mounds Interpretive Center. It includes desserts, refreshments and entertainment, as well authors Lori Belknap and Molly Wawrzyniak signing copies of the exhibit’s companion book. Admission to the reception is $20; free for members of the Museum Society. Tickets can be purchased in the museum gift shop or by calling 618-344-7316. The site is open from 9 a.m. to 5 p.m. Wednesday through Sunday; closed Monday and Tuesday. A few days after crossing the stage at spring commencement, University of Missouri–St. Louis graduate Tony Farace climbs a long staircase to the top of Monks Mound near Collinsville, Ill. Once the sacred hub of a Native American empire, the vast earthwork remains at the center of efforts to understand the region’s ancient residents. The grounds of the Cahokia Mounds State Historic Site, dotted with more than 120 mounds dating from about 900 to 1400 A.D., are familiar yet still mysterious to Farace. Cahokia’s clues to the past have been a focus of his research since transferring to UMSL from St. Charles Community College three years ago and switching his major to anthropology. His latest inquiry does just that, exploring Cahokia’s influence on pottery west of the Mississippi River. The research earned him a first-place poster presentation award at UMSL’s annual Undergraduate Research Symposium on May 1. “The focus of my recent project was pottery from six sites that go up the Missouri River,” Farace says. “I looked at the temper, finishing surfaces and also the slips that are in Cahokian pottery, and I related them to those six sites across the Mississippi. In addition to stylistic hints about where and what the people of Cahokia were trading hundreds of years ago, studying the pieces of pottery provides a sense of what these early inhabitants were eating and carrying. Farace’s own study confirmed his hypothesis that the closer the proximity of an early Mississippian pottery artifact to Cahokia Mounds, the stronger the stylistic influences. 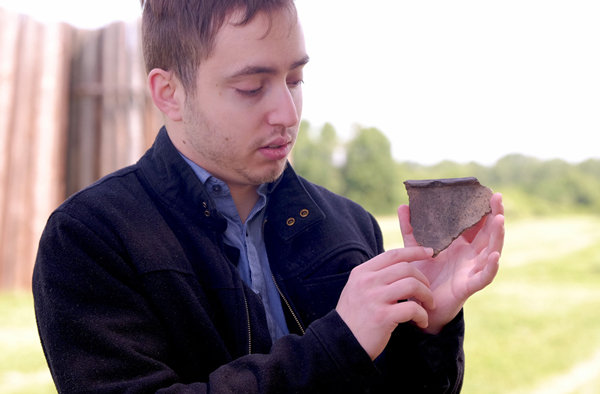 This fall, Farace will continue his education as a graduate student at Southern Illinois University – and probably his research on the pottery of Cahokia, too. He compares what he plans to investigate with what other archeologists have learned from studying lithics, such as arrowheads. During his time as a UMSL anthropology student, Farace has worked on several excavation sites throughout the region, ranging from St. Charles, Mo., to East St. Louis, Ill. Last fall, he completed an internship with the Illinois State Archaeological Society, and this summer he is a teaching assistant at a UMSL field school in Excelsior Springs, Mo. “We teach students to first survey an area without digging and then how to dig and excavate, how to do leveling and just how systematic it is,” he says. Standing atop Monks Mound, Farace remarks on the impressive view, adding offhand that evidence suggest the chief’s house was struck by lightning. Then he points at an area on the lower terrace of the mound, describing it as similar to a court or civic center. Many questions remain, including why the early urban residents of the region eventually left. Seven hundred years is a long time for a canoe to travel. Since it was made and used by Native Americans along the St. Francis River, the 22-1/2 foot long Bald Cypress canoe has been submerged in sandbars, re-discovered by fishermen and submerged again in a preservative solution at the Cahokia Mounds State Historic Site in Collinsville. Now, after three years bathing in polyethylene glycol, Borax and other chemicals, the canoe is moving on to the next part of its journey. According to Bill Iseminger, assistant site manager at Cahokia, there are only about 100 Native American wooden canoes to be found nationally, and few, if any, as old as the one now resting at Cahokia Mounds. “The preservation is very good,” Stratmann noted during a recent interview as he stood next to the canoe, pointing to tool marks and thin lines of wood grain. The state historic site acquired the canoe for about $6,000 in 2009 after fishermen casting along recently flooded parts of the St. Francis River noticed “a different-looking log” buried in a sandbar. The men unearthed the canoe. “Fortunately, they kept it moist,” Iseminger noted. Wood as old as that found in the canoe can rapidly dry out and decompose when taken out of the water. After the men failed to find an Arkansas museum to buy the piece, Cahokia Mounds stepped in and brought it to Illinois, helped by representatives from the Illinois State Archaeological Society. The canoe dates to the 1300s, the period when Cahokia itself was entering the last years of its Golden Age and when Mississippian culture stretched throughout the Midwest and near South. Stratmann, who is certified in auto body repair and is the site’s “all-around handy man,” according to Iseminger, took the lead in preserving the piece. Stratmann has made replicas of Native American tools and canoes. Preserving one was something brand new to learn. At first, that meant putting in phone calls. The site contacted other museums with ancient boats to ask about preservation methods. The task of preserving the canoe is a first-of-its-kind for the Collinsville site. “It’s all new,” Stratmann said. After learning the preservation method, Stratmann and site staff constructed a tank and frame to hold the canoe and the hundreds of gallons of preservative chemicals. The project took nine barrels of polyethylene glycol, at a cost of around $600 a barrel. With the solution drained and the canoe raised out of the tank, it will dry for a year and staff will clean residue from the preservatives off the surface with tools as simple as a soft-bristle toothbrush. The canoe would have been used for fishing, Iseminger theorized, and was both dug out using tools and burned out, he and Stratmann believe. The exact methods used to build such canoes are a matter of debate. “Unfortunately, we don’t know all their technologies,” Stratmann explained. He can pick out gouges in the canoe and the burn marks on its prow. Although the canoe’s prow is sheared off, the rest of the canoe is solid. “The preservation is really good. I always joke we should look so good in 700 years,” Stratmann said. “We’ll probably have a few cracks,” he quipped.